Selecting companies that offer investment banking in India is not as easy as it once was, given there exists too many of them. But since this could probably be the biggest step for your company- approaching an investment banker, which can potentially steer your business towards or away from success- significant amount of time must be spent on screening them and picking only the best one. After all, these are the people who will pillar-up the financial structure of your company and sustain it. What kind of industries do you specialize in? What is your biggest USP that sets you apart from other investment banks? Why should I TRUST you with my company’s finance? How many clients have you served from my industry? Where do you see my industry heading in the next 5 years? In past 3 years, how many deals you FAILED to close and why? What’s your average time to close a deal? What’s the largest size of firm you’ve had experience working with? What’s the largest transaction you have completed in any industry? Who would be the first few people, companies, or institutions you would go to for funds? Can you provide some references of recent time clients? Give me an overview, how much will be the approximate valuation of my company? 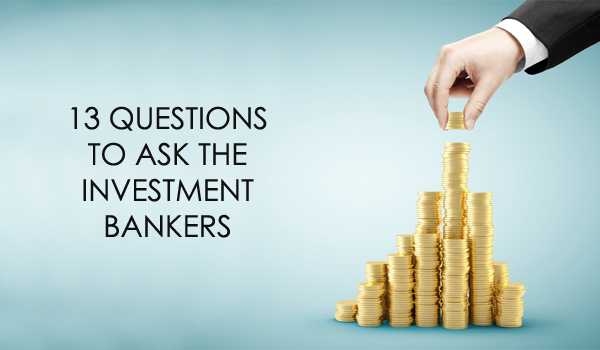 Answer to these 13 important questions will give you substantial information about the your potential investment banking companies in Mumbai, or anywhere for that matter; like their experience, expertise, work potential, and should you trust them or not. It will ease up your whole screening process and help you choose the best professionals that offer investment banking in India. So don’t sit mum the next time you’re in front of an investment banker. Keep busy, keep smart with these questions.